Sculpting with flour dough has been a traditional folk art in China for over 3,500 years. Our group is dedicated to promoting this unique form of art and incorporating western designs as well, which results in one-of-a-kind creations. Our artists have showcased their work at various cultural and art exhibitions and taught at local schools. We are coming back to showcase dough figurine art again! 10.2.2016 - We participated in Davis International Festival in order to promote art and culture exchanges between people with diverse backgrouds! 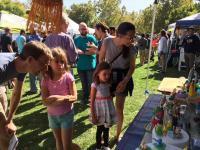 8/23/2014 - Today, we participated in the Happy Kid's Day celebration held in Cupertino, California. The 2014 Happy Kids Day hosted a wide variety of cultural activities ranging from songs and dances to games and activities, not to mention a diverse selection of ethnic delicacies. The event aspires to foster a harmonious community that is fully aware and thoroughly appreciative of cultural and ethnic diversity. 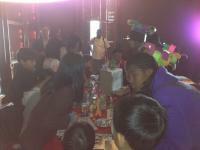 5/29/14- Two workshops were held in Davis, California to help promote Chinese traditional arts and culture. 4/12/14 - We were at the UC Davis Picnic Day Multicultural Children's Fair today! This year is special because it is the 100th Annivery of the Picnic Day Event! 2/15/2014 - Our colorful and whimsical clay creations were warmly welcomed by attendees of the 2014 Chinese New Year Celebration Ceremony. 12.31.2013 - We showcased our clay creations at Sacramento Crocker Art Museum. 12.15.13 - Some students from Dough Figurine Classes are proudly showing off what they've learned to eager young children. 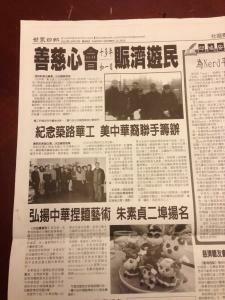 12.12.2013 - We were featured in the World Journey Newspaper! 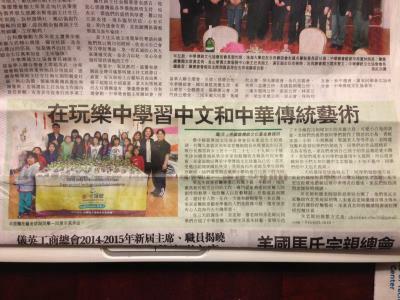 12.8.13 - Media coverage by Tsing Tao Newspaper.